The true crows are large passerine birds that comprise the genus Corvus. Ranging in size from the relatively small pigeon-sized jackdaws ( Eurasian and Daurian) to the Common Raven of the Holarctic region and Thick-billed Raven of the highlands of Ethiopia, the 40 or so members of this genus occur on all temperate continents (except South America) and several offshore and oceanic islands (including Hawai‘i). In literary and fanciful usage, the collective noun for a group of crows is a murder. However, in practice most people, and especially scientists, use the more generic term flock. There is no good systematic approach to the genus at present. Generally, it is assumed that the species from a geographical area are more closely related to each other than to other lineages, but this is not necessarily correct. For example, while the Carrion/Collared/House Crow complex is certainly closely related to each other, the situation is not at all clear regarding the Australian/Melanesian species. The Neogene fossil record of crows is rather dense in Europe, but the relationships among most prehistoric species is not clear. Jackdaw-, crow- and raven-sized forms seem to have existed since long ago and crows were regularly hunted by humans up to the Iron Age, documenting the evolution of the modern taxa. American crows are not as well-documented. A surprisingly high number of species have become extinct after human colonization; the loss of one prehistoric Caribbean crow could also have been related to the last ice age's climate changes. In addition to the prehistoric forms listed above, some extinct chronosubspecies have been described. These are featured under the respective species accounts. They appear to have evolved in central Asia and radiated out into North America, Africa, Europe, and Australia. The latest evidence appears to point towards an Australasian origin for the early family (Corvidae) though the branch that would produce the modern groups such as jays, magpies and large predominantly black Corvus. Crows had left Australasia and were now developing in Asia. 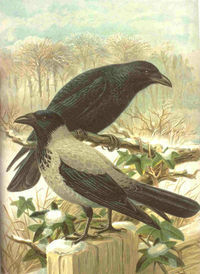 Corvus has since re-entered Australia (relatively recently) and produced five species with one recognized sub-species. For more information regarding relatives of the crows, such as magpies and jays, see Corvidae. Crows make a wide variety of calls or vocalizations. Whether the crows' system of communication constitutes a language is a topic of debate and study. Crows have also been observed to respond to calls of other species; this behaviour is presumably learned because it varies regionally. Crows' vocalizations are complex and poorly understood. Some of the many vocalizations that crows make are a "caw", usually echoed back and forth between birds, a series of "caws" in discrete units, counting out numbers, a long caw followed by a series of short caws (usually made when a bird takes off from a perch), an echo-like "eh-aw" sound, and more. These vocalizations vary by species, and within each species vary regionally. In many species, the pattern and number of the numerical vocalizations have been observed to change in response to events in the surroundings (i.e. arrival or departure of crows). Crows can hear sound frequencies lower than those that humans can hear, which complicates the study of their vocalizations. As a group, the crows show remarkable examples of intelligence. They top the avian IQ scale . Crows and ravens often score very highly on intelligence tests. Crows in the northwestern U.S. (a blend of Corvus brachyrhynchos and Corvus caurinus) show modest linguistic capabilities and the ability to relay information over great distances, live in complex, hierarchic societies involving hundreds of individuals with various "occupations", and have an intense rivalry with the area's less socially advanced ravens. One species, the New Caledonian Crow, has recently been intensively studied because of its ability to manufacture and use its own tools in the day-to-day search for food. 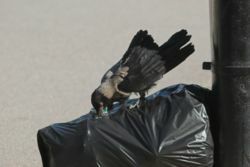 Wild hooded crows in Israel have learned to use bread crumbs for bait-fishing. Crows will engage in a kind of midair jousting, or air-" chicken" to establish pecking order. Many crow species are all black. Most of their natural enemies, the raptors or " falconiformes", soar high above the trees, and hunt primarily on bright, sunny days when contrast between light and shadow is greatest. Crows take advantage of this by maneuvering themselves through the dappled shades of the trees, where their black colour renders them effectively invisible to their enemies above, in order to set up complex ambush attacks. Thus, their black coloring is of great strategic importance to their societies. It is perhaps here where we find the greatest difference between ravens and crows; ravens tend to soar high in the air as raptors do, and like raptors, are usually the target of ambushes by crows. Crows do not appear to perceive ravens as their own kind, but instead treat them as raptors. While hawks tend to be the primary daytime predators of crows, their most deadly predators, in many areas, are the owls that hunt by night, preying upon crows sleeping helplessly in their roosts. Presumably their dark colour is particularly helpful in blending into nighttime shadows. Crows also will often mob owls much more fiercely when they find them in daylight than they do hawks and other raptors. Frequently crows appear to "play" with hawks, taking turns " counting coup" while escorting the raptor out of their territory. Their attacks on owls, on the other hand, possess a definite serious quality. an otherwise all-black crow stunningly contrasted by a full set of brilliant, pure-white primary feathers. blue or red, rather than swarthy eyes (blue being more common than red). The treatment of these rare individuals may vary from group to group, even within the same species. For example, one such individual may receive special treatment, attention, or care from the others in its group, while another group of the same species might exile such individuals, forcing them to fend for themselves. The reason for such behaviors, and why these behaviors vary as they do, has yet to be studied. Crows, and especially ravens, often feature in legends or mythology as portents or harbingers of doom or death, because of their dark plumage, unnerving calls, and tendency to eat carrion. They are commonly thought to circle above scenes of death such as battles. 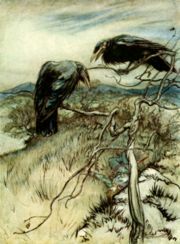 The Child ballad The Three Ravens depicts three ravens discussing whether they can eat a dead knight, but finds that his hawk, his hound, and his true love prevent them; in the parody version The Twa Corbies, these guards have already forgotten the dead man, and the ravens can eat their fill. Their depiction of evil has also led to some exaggeration of their appetite. In Pirates of the Caribbean: Dead Man's Chest, The Omen II and Exorcist: The Beginning, crows are shown tearing out people's eyes while they are still alive. This, of course, does not happen as crows can distinguish between carrion and living people. In Native American folklore, Crow is often seen as a similar trickster to Coyote. However, Crow's tricks tend to be more out of malice and they rarely (if ever) are portrayed as a hero. One possible explanation for this is that crows are often considered a pest to crops, which the tribes who came up with the stories featuring Crow needed to survive. In the Epic of Gilgamesh, the Chaldean myth, the character Utnapishtim releases a dove and a raven to find land, similar to what Noah does in the book of Genesis. However, in the Epic of Gilgamesh, the dove merely circles and returns. Only then does Utnapishtim send forth the raven, who does not return. Utnapishtim extrapolates from this that the raven has found land, which is why it hasn't returned. This would seem to indicate some acknowledgement of crow intelligence, which may have been apparent even in ancient times, and to some might imply that the higher intelligence of crows, when compared to other birds, is striking enough that it was known even then. In occult circles, distinctions are sometimes made between crows and ravens. In mythology and folklore as a whole, crows tend to be symbolic more of the spiritual aspect of death, or the transition of the spirit into the afterlife, whereas ravens tend more often to be associated with the negative (physical) aspect of death. However, few if any individual mythologies or folklores make such a distinction, and there are ample exceptions. Another reason for this distinction is that while crows are typically highly social animals, ravens don't seem to congregate in large numbers anywhere but a) near carrion where they meet seemingly by chance, or b) at cemeteries, where large numbers sometimes live together, even though carrion there is no more available (and probably less attainable) than any road or field. Amongst Neopagans, crows are often thought to be highly psychic and are associated with the element of ether or spirit, rather than the element of air as with most other birds. This may in part be due to the long-standing occult tradition of associating the colour black with "the abyss" of infinite knowledge (see akasha), or perhaps also to the more modern occult belief that wearing the "colour" black aids in psychic ability, as it absorbs more electromagnetic energy, since surfaces appear black by absorbing all frequencies in the visible spectrum, reflecting no colour. A very incomplete list includes the eponymous Pacific Northwest Native figures Raven and Crow, the ravens Hugin and Munin, who accompany the Norse god Odin, the Celtic goddesses the Mórrígan and/or the Badb (sometimes considered separate from Mórrígan), and Shani, a Hindu god who travels astride a crow. In Greek mythology, it was believed that when the crows gave bad news to the goddess Athena, she flew into a rage, and cursed their feathers to be black. Myths in India -Hindu it is believed that people who died will take food and offerings through a variety of crows called "Bali kkakka". Every year people whose parents or relatives died will offer food to crows as well as cows on the Shradha day. The American crow is very susceptible to the West Nile virus, a disease just recently introduced in North America. American crows usually die within one week of acquiring the disease with only very few surviving exposure. Crows are so affected by the disease that their deaths are now serving as an indicator of the West Nile Virus’activity in an area. The city of Moss, Norway has a crow in its coat-of-arms.